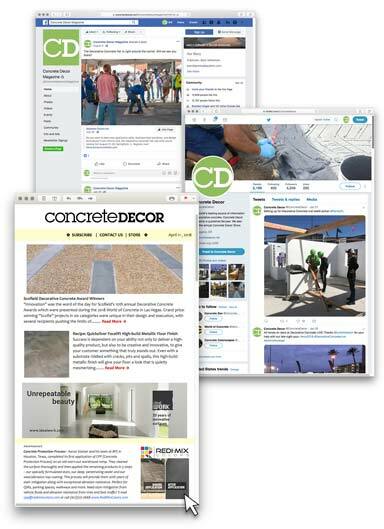 Concrete Decor stays active on the social media front and offers our constituents yet another way to stay connected to our online audience. We can point our readers to an advertorial you provide through our sponsored content program or do a linked callout to let them know you are one of the companies featured in our magazine content available in print and online. In addition to scheduled callouts on Twitter and Facebook that will direct traffic to our website that’s linked with yours, we offer banner ad services through our e-newsletter. Emailed only to an opt-in audience, the newsletter is among our vehicles that helps disburse sponsored content, magazine content, training events and industry news in a neat package that’s delivered free to our readers.